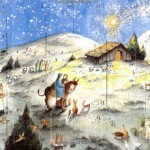 We found this heartwarming children’s Christmas story over at Catholicmom.com. Focusing on a Christmas tree, the story advocates selflessness and love, and reminds us all of the true spirit of Christmas: knowing that we are loved by God. The story, entitled “The Christmas Tree Who Wished for a Star,” is too long to be re-posted in it’s entirety, but can be found here. Thanks to Katherine Valentine, author of the story, and all the fantastic contributors at catholicmom.com. Put the troops on your Christmas shopping list! Generosity is a major component of Christmas, and though it comes in many forms (mostly in gift-form), giving back to the community is a rather productive way to show just how generous you are. With that in mind, this year I am planning on giving back to the troops. There are plenty of ways to donate to the military, with some sites simply asking for enough money to cover postage for letters! You can write letters, sponsor care packages, or even make your own. And if you choose this latter option, you’ll also have the opportunity to be a bit creative. Oh sure, the basics are important in creating a care package: soap, blankets, etc., but what about something special in there as well? 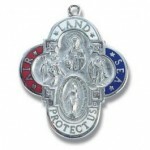 A letter showing your appreciation, a St. Michael or St. Christopher medal to keep them safe, even maybe a game! Sending off a care package or donating online to the troops definitely raises a bit of suspicion at times: how can you be assured your gift actually reached the troops? Well, mycatholicblog suggests sticking to well-established organizations, like the USO or soldiersangels.org. And yes, your donations are often received anonymously, but that’s sort of the point of generosity, really: to give without expecting anything in return. The troops do it for us all year round. The very least we can do is give back during the holiday season. Did anyone catch the new “Hallmark Hall of Fame” holiday movie, “November Christmas”? The television movie stars John Corbett, Sarah Paulson and Sam Elliot. Taking place in Rhode Island, the story tells of Corbett’s and Paulson’s 8 year old daughter Vanessa and her struggles with cancer. Though Vanessa’s parents remain optimistic, they decide to push the holidays forward so that Vanessa may enjoy them while still healthy enough. 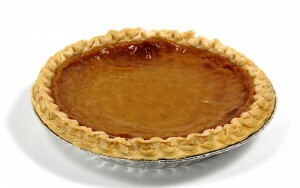 And of course (as this is a Hallmark holiday movie), the entire community participates. You might say it’s about the domino effect of inspiration, or about the inherent good in human hearts, or you might say it’s just a sentimental Christmas story. Whatever you call it, keep a couple of Kleenex handy. “November Christmas” has also been described in other early reviews as “critic-proof,” and CBS is sure to repay it several times during this holiday season. We can’t wait to see it! As per tradition, every year my mom buys me an advent calendar. They’re always different, yet contain equally ridiculous themes: “Christmas Around the World,” “Charlie Brown Christmas,” “Santa’s Workshop,” etc. When I was younger I only cared for advent calendars because it meant a guaranteed chocolate each day. As I got older I more or less dismissed the calendar, and it came to be just another silly way mom showed her love. But this year, as I prepare for yet another random calendar, I find myself pondering over the origin of the calendar. Where and when was the advent calendar invented, and why do we need a paper calendar with perforated lines around each day; why can’t we just remember the date in our heads? The term Advent comes from the Latin “adventur”, meaning arrival.The tradition of marking the Advent dates back to the early 19th century, when when religious Protestant families made a chalk line on their front door for every day in December until Christmas Eve. According to Sellmer-Verlag, the Dutch on-line museum of Advent Calendar history, the first Advent Calendar was handmade in 1851. Early Advent styles also included the Advent Candle, in which a ring or wreath of 24 candles would be used to illuminate each day until Christmas. Sellmer-Verlag, the Dutch on-line museum of Advent Calendar history, cites the German-born Gerhard Lang as the inventor of the first mass-produced Advent Calendar. Lang was inspired by the calendars he remembered his mother making for him as a child. She would attach a candy to a hand-drawn cardboard calendar. Instead of candies, Lang’s printed version featured tiny pictures that could be affixed to each day of the Advent. Lang later produced several different versions of the calendar, including ones with little doors to open, revealing a picture for each day. The German printing company Sankt Johannis capitalized on Lang’s idea, producing calendars with Bible verses instead of pictures behind each window. The Advent Calendar became increasingly popular in Germany and throughout Central Europe until World War II, when manufacturers were forced to shut down production due to the war rationing on cardboard. 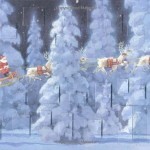 By the 1940s, the tradition of the Advent Calendar had jumped the Atlantic Ocean and taken root in American culture. Here, the first chocolate-filled calendars were sold in the late 1950s. Still, I’ve come to realize that despite the theme of the particular advent calendar, the most important factor is that all advent calendars put just a bit more emphasis the upcoming day of December 25th. Ultimately, it’s up to all of us to remember the true meaning of the holiday, and why Christmas is celebrated. But hey, if we can do that and eat some chocolate, why not! Below is a podcast we recorded for My Catholic Blog in November 2010 with Ellen Gable Hrkach. Ellen Gable Hrkach is the author of “In Name Only” and also “Emily’s Hope.” Ellen’s publishing company Full Quiver Publishing and is a contributor to Catholic Mom and Amazing Catechists. You can also find Ellen and Full Quiver on Facebook and by email as well. I was blessed to have caught up with Ellen after we began a dialogue following the Catholic Marketing Network Trade Show in August 2010 in King of Prussia, PA. We did an earlier interview with Elen Gable Hrkach for the site back in September 2010. Every year on Black Friday, vast amounts of people line up in the early a.m. hours, just hoping to grab that coveted gift before it sells out. There’s pushing, yelling, and occassional stampedes. And every year for as long as I can remember, there has always been those who are injured. Now, I have to admit, the proceeding news stories that night which show mothers and the alike passionately arguing over a stuffed toy is fairly amusing (does anyone remember the particular Black Friday chaos surrounding “Tickle Me Elmo” ?!). But in this, the digital age, these people’s behavior is mostly just bewildering. Why, oh why, would you not just shop online?! Almost every mass produced item or “hot” gift out there is online, ready for purchase with just a click of the button. Stand outside with “elbows out” at 4 a.m. in the freezing cold, or sit in my pajamas and surf the web? The choice seems painfully obvious. 1. 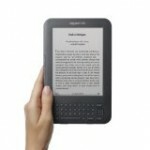 A Kindle: Lightweight, portable, environmentally friendly, and relatively cheap (starting at $139). Like a book from the future. 2. The iPhone 4: Describing all the functions of the iPhone, of any generation, would take numerous blog entries. Sufficient to say, this thing is beyond cool. 3. Jewelry: The classic gift. More than just size or price value, the big theme within the jewelry sector is meaning. With that in mind, how about a piece of religious jewelry? Beauty, meaning (and if you look in the right spot, like here), affordability all wrapped in one. Easy. Click, click….done. Bet those people are still waiting outside the store. 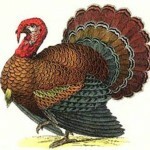 Q: Why can’t you bring a turkey to church? A: Because they have such FOWL language! The new Harry Potter film is an utter success. Pulling in opening weekend sales of $125 million, Harry Potter and the Deathly Hallows, Part 1 begins the final stage of Harry Potter’s story. Now, of course, Harry Potter attained an iconic status a long time ago, but following fame has always come the controversy that J.K. Rowling’s stories bring. Many criticize the seeming advocacy of witchcraft and pagan religions, uncomfortable with the “innocent” spin that the book/film series places on wizardry. What I loved about this movie was very similar to what I loved about the book: Harry’s previous exploits come together to aid him in his quest to do the impossible and I thought those elements were handled fairly throughout and beautifully in the end. Lessons the three learned in previous adventures and friendships they formed are continually playing a part in their adventures and though the movie ends on a sad note, I thought it ended with a tremendous amount of hope. Harry’s example of self-sacrifice and bravery is emulated by an odd friend who makes for an unlikely hero. This humble self-sacrifice reminded me of two things that are important for the Christian to remember. First, if we are to battle the darkness of this world, we must do so by dying to self. Second, people are always watching what we do, if we live humble lives of service to others, some of those people might just follow our example as we follow Christ. Much like the world of The Deathly Hallows, ours is a very dark world but by faith and with the help of genuine friends, we can face it with determination. Now, I saw the film and I am inclined to agree; through all the cinematic flash and imaginary elements, the feelings projected through the characters remained quite real. I strongly sensed the love between friends, the respect for elders/professors, and the admirable bravery. And like Dixon, I also left the cinema feeling hopeful! Despite various background elements of the story (Hogwarts, magic, etc), the overriding moral that J.K. Rowling has always tried to convey is that one must choose the Good–no matter how difficult it may be. The new T-Mobile ad is AWESOME. Filmed at Heathrow International Airport in late October, the ad features a flash mob greeting thousands of landing passengers and those awaiting at the gates…by song. And the best part? T-Mobile’s message at the end: Life’s for sharing. What a great way to express love and harmony. The amazing video can be found on YouTube here , or at Deacon Greg Kandra’s blog (where mycatholicblog originally saw the ad), here.